By dusk on the first day of the Rolex Middle Sea Race, the leading yachts are expected to be in the vicinity of Capo Passero, the extreme southeastern point of Sicily and the first significant tactical point in the race. The northwesterly gradient breeze meets the northerly breeze emanating from The Strait of Messina and the convergence of these two winds is causing an area of little wind, which the fleet must cross. As the leading yachts approach Capo Passero, the wind seeker on board each yacht is likely be aloft, looking for signs of breeze. Behind Capo Passero is Mount Etna, the tallest active volcano on the European continent (3,329m). Etna produces its own micro-climate, and as night falls, the land tends to cool down causing the wind to flow down the valleys in a phenomenon known as land drainage. Going inshore can pay off but can also result in being becalmed and might be considered a high risk strategy. A safer option is to stay out of the effect of Etna all together, but this requires a significant move towards the east. "My Dad taught me that you win or lose the Rolex Middle Sea Race in light winds, so I teach my crew this is where you win the race." Commented Christian Ripard, co-skipper of last year's overall winner, J/122 Artie, owned by Lee Satariano. "Everybody can sail in a good wind but we have strived very hard to make sure Artie performs well in the light. If you are going just a fraction of a knot more than a competitor and get ahead, when the breeze does kick in, that lead multiplies. In the light you can sail 5 or 10% better than the opposition and that is difficult to achieve in a true wind. Spotting wind on the water is very important. If you see a gust you sail for it, regardless of your heading, and you sail from gust to gust. At night, I use normal binoculars and with a trained eye you can see the zephyrs coming down, it was much easier this year as we don't have much swell during the night and you are looking for contours, ripples and dark patches." Lloyd Thornburg's American MOD 70, Phaedo3, was leading the fleet. The bright green trimaran had covered 50 miles in just 5 hours, considering the light conditions, this is a remarkable speed. George David's American Maxi, Rambler 88 leads the monohulls, having covered 41 miles. Jan-Henrik Kisteit's German Maxi 72, Momo has been the star performer in the big boat class. Michele Galli's TP52, B2 have also started well. 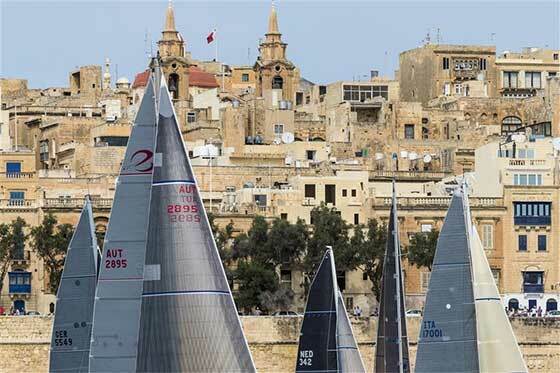 Of the seven Maltese boats taking part, two yachts have performed well in the early stages of the race. Josef Schultheis and Timmy Camilleri's XP-ACT Bank Sails and Lee Satariano's J/122 Artie, co-skippered by Christian Ripard. The two Maltese yachts are virtually side by side, half way to Capo Passero. David Collins' British Swan 45, Tala has made good progress and is in a strong position. Paolo Semeraro's Neo Double Banks Sails and Dermot and Paddy Cronin, sailing Encore are in top form in the Double Handed Class.